Everyone deserves to feel safe in the space they call home, whether that’s a six-bedroom house or a studio apartment. So if you’re the property manager for an apartment complex in Philadelphia PA, security is one of your foremost concerns. You need to keep your residents and your property secure, and you need to do so in the most cost-effective manner possible. Whatever the size of your complex, the layout of your property, or the neighborhood you’re based in, effective apartment security comes down to smart decision making. One of the most important decisions you’ll need to make is which type of security service you hire. Should you hire mobile security services? A dedicated security presence? Or will you need a combination of both? Here are some tips from the apartment security experts at Signal 88 of Greater Philadelphia on how to decide between mobile and dedicated apartment security. When hiring an apartment security service in Greater Philadelphia, the choice between mobile security services and a dedicated security presence will be determined by a range of factors. These include the costs of different services, security risks to your property, the inherent limitations of different security services, and the size, layout, and location of your property. In terms of cost-effectiveness there is no better option than mobile patrol security. Mobile security services cost a fraction of what it costs to hire a dedicated onsite security presence. Despite their lower price tag, mobile patrols are often just as effective — if not more so — than dedicated security in terms of both criminal deterrence and response to security events. In Greater Philadelphia, mobile patrols are an excellent option for properties with limited security budgets, large footprints, and a high number of exterior access points. While more and more properties are choosing mobile patrol services, some apartment buildings in Philadelphia will still require dedicated apartment security. High-occupancy buildings in densely populated areas, for instance, may require indoor foot patrols, which are typically performed by dedicated security personnel. If your property has a single main entrance, a dedicated security presence may be expected by residents. If you have a larger property, you might consider a combination of mobile patrols and dedicated onsite staff. Dedicated onsite security can be stationed at main entrances and/or high-traffic areas, and can perform interior building patrols. Exterior patrols, meanwhile, can be performed by mobile security, which offer greater visibility than foot patrols. Should a security event take place, mobile security personnel can provide onsite staff with fast-response support. Looking for a smarter approach to apartment security services? 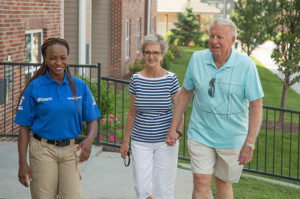 Signal 88 of Greater Philadelphia provides customized apartment security services for properties in Philadelphia, King of Prussia, Bensalem, Norristown, Fort Washington, and surrounding areas. Call us today at (610) 489-1890 to learn more or to request a security consultation.